Whenever you pick up a tied bag of litter adopt the following procedure. Begin by photographing the bag in situ, with if possible a landmark in the picture. 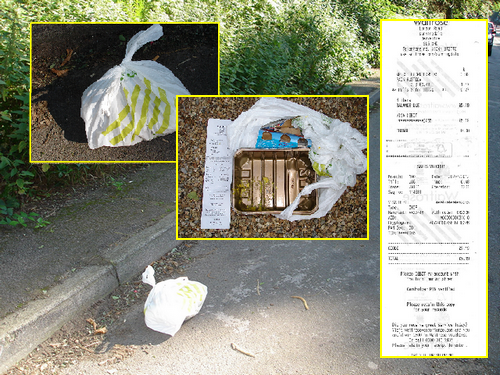 Then, when a bag of litter is accompanied by a credit card receipt or loyalty card voucher photgraph the contents and scan the dockets. Save the information on your file system. When speaking to the large supermarket groups it is clear there is no technological barrier to tracing the person who undertook the transaction. If enough evidence of this nature is gathered it may bring about changes that would compel these companies to do something about the perpetrators of this offence. Don't forget to set the resolution on your camera and scanner to a low level as otherwise you'll be running out of disk space all too quickly!